Updated Posting - January 14, 2009, 6:00 pm, Washington, D.C. – At a hearing today concerning the risks posed by the presidential transition to the recovery of millions of missing e-mails from the Executive Office of the President (EOP) in the National Security Archive's lawsuit seeking restoration of those e-mails, the White House acknowledged that it has done little to recover e-mail files from computer workstations and nothing to collect external media storage devices that could hold e-mails. These admissions came despite the issuance of a report and recommendation in April 2008 by a federal magistrate judge calling for the White House to locate and preserve data from the workstations and external media storage devices. Earlier today the court issued an order requiring steps to be taken to secure files from individual computer workstations, memory sticks, zip drives, DVDs and CDs. "The White House admitted it did nothing to stop people working in the White House from disposing of memory sticks, CDs, DVDs and zip drives that may have been the sole copies of missing e-mails on them," stated Sheila Shadmand from Jones Day, counsel for the Archive. Ms. Shadmand warned: "We believe our ability to get a complete restoration of the White House record from 2003 to 2005 and evidence of what went wrong has been compromised." The Archive's Director, Tom Blanton noted: "If this kind of irresponsible conduct can take place despite the Executive Office of the President's obligations under the Federal Records Act and this lawsuit, then perhaps the country needs more oversight of record-keeping in the White House." "The court made clear today that any additional work that the White House has to do before its occupants depart is its own fault," said Meredith Fuchs, the Archive's General Counsel. "As the magistrate judge implied, they rolled the dice hoping they would get this case thrown out of court and they lost. Now they have to make up for lost time." Despite prior contradictory statements about whether any White house e-mails had been lost, the government's lawyers also admitted they have now located at least 14 million missing emails and that a major restoration project has been commenced to recover additional missing e-mails from backup tapes. Assurances from the White House that the entire Executive Office of the President will comply with the extended preservation order. 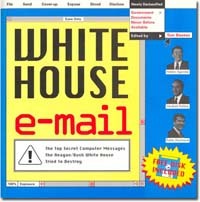 Washington, D.C., January 14, 2009 – The United States District Court for the District of Columbia today granted the National Security Archive's emergency motion for an extended preservation order to protect missing White House e-mails. With the transition from the Bush Administration to the Obama Administration taking place in six days, and all the records of the Bush White House scheduled for a physical transfer to the National Archives and Records Administration (NARA) on that same day, the Court has directed the Executive Office of the President (EOP) to search all its computer work stations and has ordered EOP employees to surrender any media in their possession that may contain e-mails from March 2003 to October 2005. "There is nothing like a deadline to clarify the issues," said Archive Director Tom Blanton. "In six days the Bush Executive Office of the President will be gone and without this order, their records may disappear with them. The White House will complain about the last minute challenge, but this is a records crisis of the White House's own making." Counsel for the Archive, Sheila Shadmand from Jones Day made clear: "The White House has been on notice since we filed our lawsuit a year and a half ago that they would have to retrieve and preserve their e-mail. Instead of coming clean and telling the public what they have been doing to solve the crisis, they refused to say anything. At this point, it is critical to preserve evidence that can help get to the bottom of the problem and prevent it from happening again." 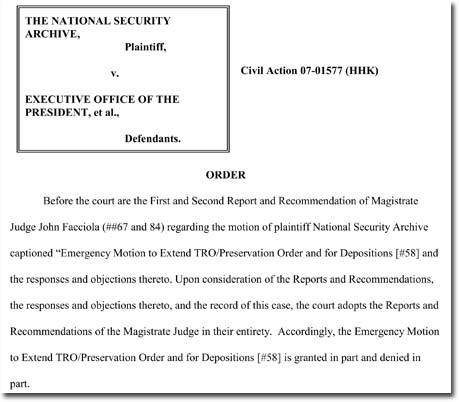 The Archive filed its emergency motion for an extended preservation order on March 11, 2008. After considering the objections of the White House, Magistrate Judge Facciola issued two reports, on April 24 and July 29, 2008, recommending that District Judge Henry H. Kennedy issue an order requiring search, surrender and preservation of the computer workstations and external media devices, such as CDs, DVDs, memory sticks, and external hard drives. Today's order adopts those reports and recommendations, granting in part the Archive's emergency motion. The National Security Archive filed its lawsuit on September 5, 2007 against the Executive Office of the President and NARA, seeking to preserve and restore missing White House e-mails. A virtually identical lawsuit filed subsequently by Citizens for Responsibility and Ethics in Washington (CREW) has been consolidated with the Archive's lawsuit. A chronology of the litigation is available here.